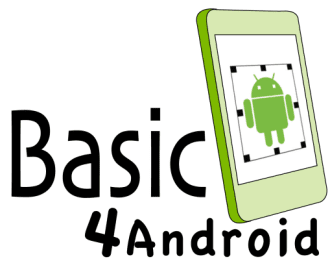 B4A ဆိုတာ Android Application ဖန္တီးတဲ့ Software တစ္ခုပါ.. Java တို႔ Android Studio တို႔ေလာက္လည္း မခက္ဘူး.. ခုေနာက္ပိုင္း အေပ်ာ္တန္း Android Application ေတြနဲ႔ နည္းနည္း အဆင့္ျမင့္ Android Application ေတြကို B4A နဲ႔ပဲ ေရးၾကတာမ်ားပါတယ္.. B4A ကိုတင္ၿပီးရင္ Andrid SDK နဲ႔ Java ေတြကိုလည္း တင္ၾကရပါတယ္.. အခု ေပးမွာကေတာ့ B4A 8.0 Full Version ပါ.. Setup နဲ႔ Install လုပ္ၿပီးရင္ Launch ကိုအမွန္ျခစ္ျဖဳတ္ၿပီး Close ကိုႏွိပ္ပါ.. Internet ကိုပိတ္ပါ.. Crack Folder ထဲက ဖိုင္ ၂ ခုကို Copy ယူထားပါ.. Desktop ေပၚက B4A icon ကိုကညာကလစ္ေထာက္ၿပီး Open File Location ကိုႏွိပ္ပါ.. ခုနက Crack Folder ထဲက Copy ယူထားတဲ့ File ၂ ခုကို Paste လုပ္ပါ.. Overwrite ေတာင္းလာရင္ ခြင့္ျပုလိုက္ပါ.. ဒါဆိုရင္ B4A 8.0 ကို Full Version သံုးႏိုင္ပါၿပီ..
B4A ဆိုတာ Android Application ဖန်တီးတဲ့ Software တစ်ခုပါ.. Java တို့ Android Studio တို့လောက်လည်း မခက်ဘူး.. ခုနောက်ပိုင်း အပျော်တန်း Android Application တွေနဲ့ နည်းနည်း အဆင့်မြင့် Android Application တွေကို B4A နဲ့ပဲ ရေးကြတာများပါတယ်.. B4A ကိုတင်ပြီးရင် Andrid SDK နဲ့ Java တွေကိုလည်း တင်ကြရပါတယ်.. အခု ပေးမှာကတော့ B4A 8.0 Full Version ပါ.. Setup နဲ့ Install လုပ်ပြီးရင် Launch ကိုအမှန်ခြစ်ဖြုတ်ပြီး Close ကိုနှိပ်ပါ.. Internet ကိုပိတ်ပါ.. Crack Folder ထဲက ဖိုင် ၂ ခုကို Copy ယူထားပါ.. Desktop ပေါ်က B4A icon ကိုကညာကလစ်ထောက်ပြီး Open File Location ကိုနှိပ်ပါ.. ခုနက Crack Folder ထဲက Copy ယူထားတဲ့ File ၂ ခုကို Paste လုပ်ပါ.. Overwrite တောင်းလာရင် ခွင့်ပြုလိုက်ပါ.. ဒါဆိုရင် B4A 8.0 ကို Full Version သုံးနိုင်ပါပြီ.. Expand the capabilities with external libraries. Many guides and even many tutorials. Not need dependencies or frameworks. Simple and easy to use visual designers. Compile the program and share everywhere. 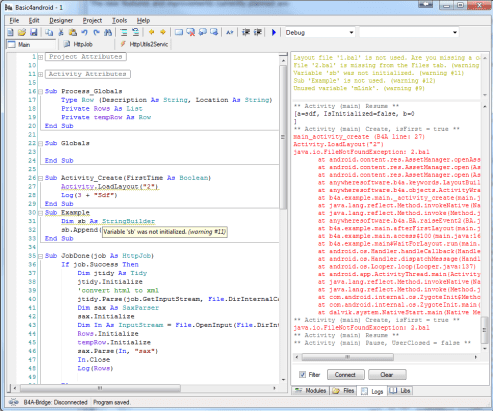 Write the code in the advanced IDE. Supports all types of hardware devices.